Today’s post is about a J. M. Barrie quote that is often misworded resulting in a completely different quote with a completely different meaning. The quote is actually about the topic of charm, but the reworded quote leads us to believe it is about love. Follow along to learn who is propagating this falsehood. I have researched many misquotes, but I have to say this particular one has more variations than any other I have seen thus far. The variations listed above are the most popular, but they come in many other flavors. Some have additional words inserted; some have words deleted; some have words rearranged, and some have all three. Some are split into two separate sentences; some are not. Punctuation varies widely. Love: If you have it . . .
Love… If you have it . . .
Love, if you have it . . .
Love? If you have it . . . Exactly when someone decided to introduce love into this quote, I don’t know. But what I do know is that this quote is not about love. Surprise! 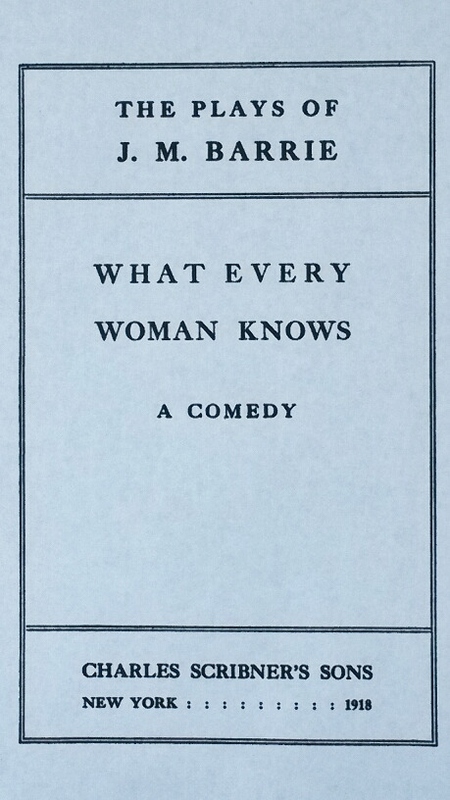 A few years after the successful release of his play Peter Pan, J. M. (James Matthew) Barrie wrote a comedy titled What Every Woman Knows. This quote is from Act I of that play. The quote is part of a reply by the character, Maggie, to a question posed to her about charm. What follows are pages 14 and 15 of the 1918 publication of the play. 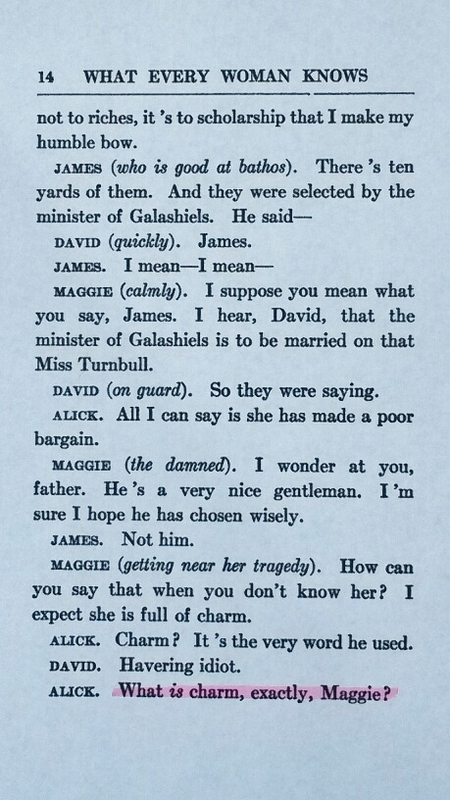 Note the question about charm is at the bottom of page 14 highlighted in pink followed by the quote, found in Maggie’s reply, at the top of page 15 highlighted in yellow. As you can see, the context of the quote is the topic of charm and what exactly it is. I can only speculate as to how it came to be about love. My guess is that it has something to do with an earlier conversation in the play. 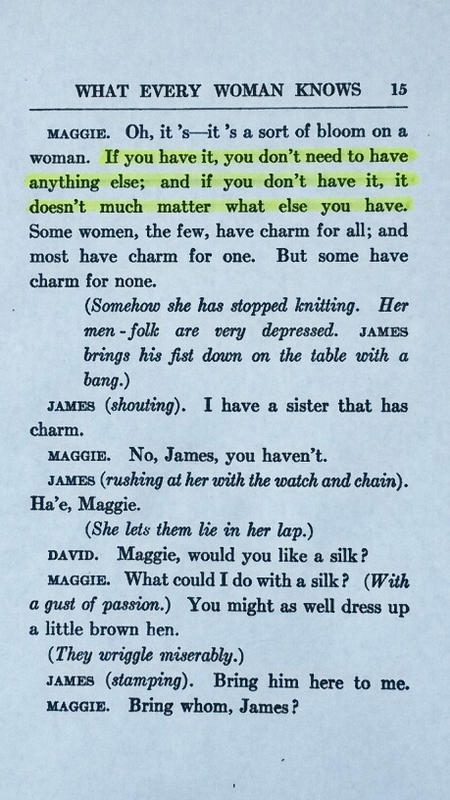 Prior to meeting Maggie, the male characters have a discussion about love; perhaps this is how it gets associated with the quote. After surveying 113 websites featuring the misworded quote, I found the following trends. Based on the above statistics, websites that specialize solely in quotes are the biggest offenders. As we’ve seen in so many of my previous posts, this is extremely common. I must reiterate that these sites should never be used as a resource for quotes. Social media websites are a very close second. This means you should never trust a quote that is sent to you via Facebook, Twitter, Pinterest or any other social media site. As we have learned before, the quote virus does its best work through social media. When one person posts a contaminated quote, it spreads to all of his/her followers who spread it to all of their followers and so on and so forth. Informational websites come in third which is unusual. Typically this category falls into a single-digit percentage. To date, I’ve only researched three other misquotes with informational websites ranking in double-digit percentages. The moral of this story is even websites dealing with facts such as news, statistics, and other data can be infected with misquotes. I came across six books published in the 2000s featuring today’s misquote. One of them was a quotes-only book. I must reiterate if a quote book does not provide detailed source information for each quote, it is not reliable. The name attribution alone is not sufficient. It should be accompanied by the work in which the quote is found followed by applicable information such as chapter, act, scene, stanza, line, etc. Many authors create their quote books by simply compiling quotes they’ve collected from unreliable sources. Additionally, many of them further complicate things when they transcribe the quotes incorrectly resulting in misworded, misattributed, inaccurate data. This creates a breeding ground for the quote virus: one reader copies the infected quote onto one of his/her social media websites which then infects all of his/her followers who infect all of their followers ad infinitum. As usual, today’s misworded quote is available for purchase. I came across a wall art company selling it for $20 to $50 depending on size. The artwork is actually very creative and beautiful. What a shame that it’s flawed.